A student group in Cameroon is using volunteerism, team-work, and education to develop their vision of the future, writes Carole Nyemeck, 21, a Correspondent from Yaounde in Cameroon. For some, the dream includes studying in America to solve Africa’s problems. “The sky is the sole limit!” This could be the very leitmotiv of youth attending the Education USA Cameroonian Student Achievers Club (CAMSAC) at the Yaoundé US Embassy in Cameroon. In a difficult socio-economic context, CAMSAC students are shaping their own “African dream” by daring to soar. They have identified education, leadership in volunteerism and community services, and networking as the levers to break the cycle of poverty and underdevelopment. Yaoundé, the political capital of Cameroon, is home to the most diverse population of the country, with people from all regions and ethnicities. As well, it is the pre-eminent centre of civilization for the nation. Yet we regularly observe major water, electricity and road deficits that severely damage the daily economic activities. We also know of the painful transition from school to work. However, amidst all these difficulties, it is always possible to emerge. 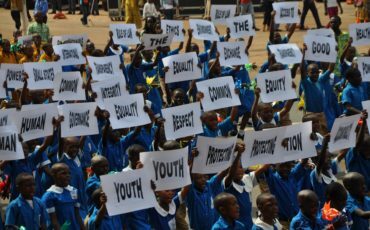 It is in this regard that CAMSAC among other youth-empowered groups came to being in 2012. CAMSAC attendees and their supervisors share in common the belief that education is the key to success. In fact, the CAMSAC students are all enrolled in Cameroonian high schools and universities, but desiring to study in America. Why the United States? Not because of a people or country, but rather because they want to manipulate science and knowledge at their apex, with the most brilliant minds of the world, through the most top-notch tools and resources. It so turns out that the American higher education system is among the most favourably poised to provide the aforementioned. After all, Africa really needs its next generation of leaders in all realms of society to devise their own conception of development and Pan-Africanism. As Marian Wright Edelman once said: “Education is for improving the lives of others and for leaving your community and world better than you found it.” The latter part of this quote optimistically explains why the second pillars of CAMSAC are volunteerism and community services. Indeed, through these programs students learn to empower and advocate for their community through social initiatives like sanitation camps, entrepreneurial workshops and training, setting up libraries and investment in human resources to cite only a few. Much more than that, participants learn methods of good governance and a deep sense of duty towards one’s own people. If you add the ability to effectively connect and communicate with and within a group to our already mouth-watering recipe, you get a wonderful and enjoyable meal! Each student comes alone, with his own luggage of dreams and talents, but soon learns to work in teams and convey informations and ideas. This process helps to build lifelong friendships, and enables the student to become a well-rounded person who is willing to relevantly associate with different people. We can then paraphrase Saint Francis of Assisi when he said “If you differ from me, you rather enrich me!” Networking also takes the face of the Cameroonian students learning American culture while their American supervisors learn the Cameroonian one, for a better understanding for both parties. Finally, CAMSAC students are shaping their own “African dream” in the heart of Yaoundé, through the pursuit of a honed and savvy education, leadership in volunteerism and community services, as well as networking. More than ever, African youth have to become active civic participants through leadership in youth led-groups and the rise of social entrepreneurship. This demands that they be patient and willing to work together in perseverance to tackle the most pressing socio-economic issues of their era. As Joshua S. Goldstein and Jon C. Pevehouse noted in the book “International relations”: In the years to come, state actors (governments) will lose a great portion of their power to the profit not of a sole superpower or group of great powers, but rather of non-state actors (civil society), as the new powerful sources of political economic growth and development.